When it rains, it pours!!!! Melanoma patients over the last twenty years have not seen any progress in the fight to cure Melanoma. 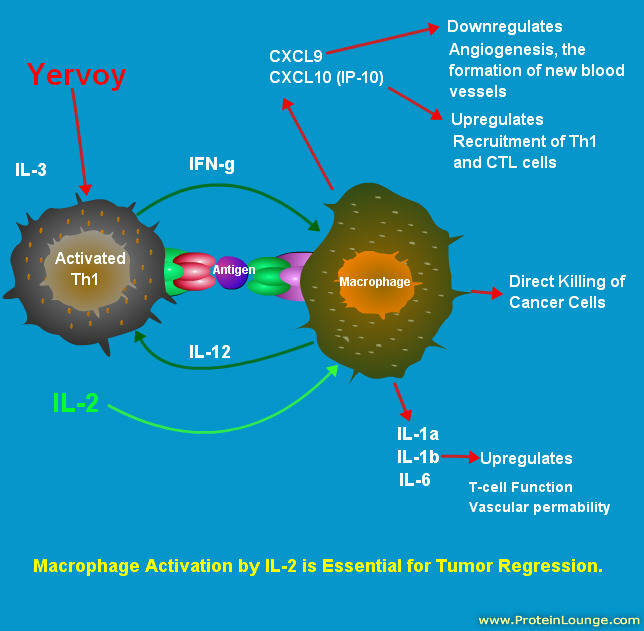 That has all changed in 2011 when the FDA approved Yervoy (Ipi..Ipilimumab), an anti-CTLA-4 monoclonal antibody and Zelboraf (vemurafenib). Well, this all going to change Melanoma from a cancer to a chronic disease that may be stabilized or even cured. The new Kid on the block( PD-1) is another Surface molecule that is unregulated when the T-cells are activated. This molecule is time dependent , which means that over time it migrates to the surface. Base on the research today, PD-1 molecule causes global inhibition to activated T-cells and down regulates the IL-2 expression by the PI3K/Akt pathway. 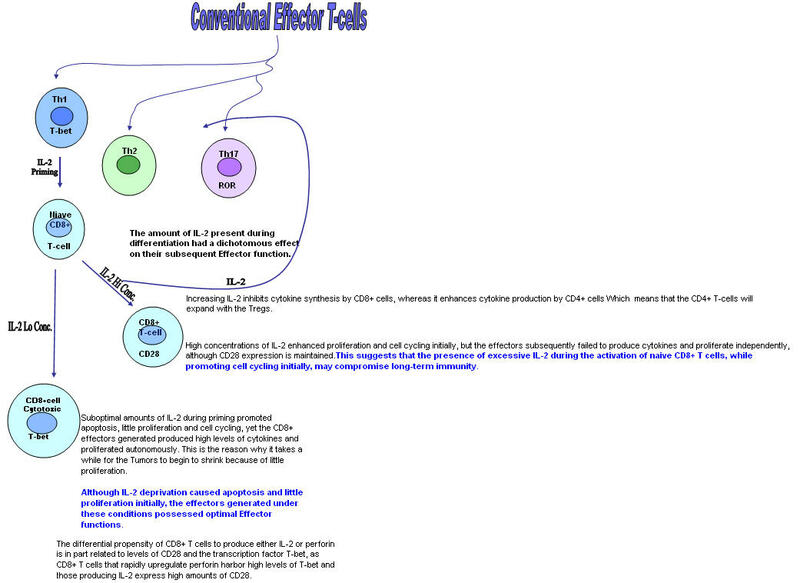 It also inhibits the ICOS molecule that is an important co-stimulator for the T-cells. So with stakes high to be the first to market, Bristol Myer Squibb, a little known company, Amplimmune, co-sponsored by GlaxoSmithKline and Curetech, a subsidiary of Teva Pharma of Israel are in the race of their lives. Winner takes all. And to throw Icing on the cake, the blockage of both inhibitors (PD-1 and CTLA-4) have shown remarkable ability to eradicate Melanoma tumors in mice. Bristol Myer Squibb seems to be leading this race with a clinical trials recruiting at Sloan Kettering in New York and Yale in Connecticut. So with this in mind, if was seeking to try a clinical trial at this time, I would seek out the combination first, then PD-1 and if all else fails, Anti-CTLA-4 therapy followed by IL-2. I see a Stabilization/Cure on the horizon for this disease and others based on these immunotherapies. 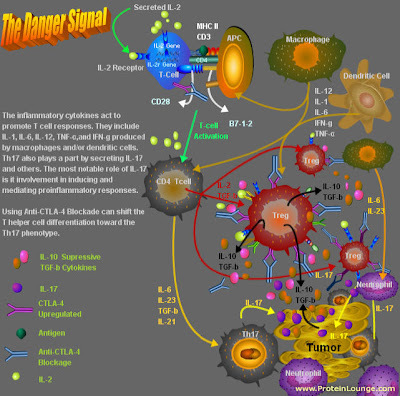 The T-cell-specific cell-surface receptors CD28, CTLA-4, ICOS and PD-1 are important regulators of the immune system. CD28 potently enhances those T-cell functions that are essential for an effective antigen-specific immune response, and the homologous CTLA-4 counterbalances the CD28-mediated signals and thus prevents an otherwise fatal overstimulation of the lymphoid system. PD-1 engagement can prevent ICOS but not CD28 costimulation. The inability of ICOS costimulation to override PD-1 inhibition is directly related to the low IL-2 levels it induces upon its engagement. ICOS Costimulation requires IL-2 and can be prevented by CTLA-4, PD-1 engagement. 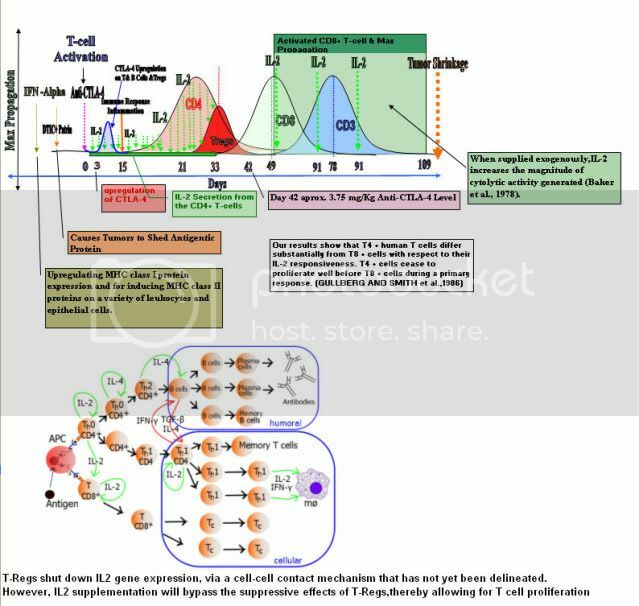 With the CD3/CD28 blocked downstream at the P13K and the Akt pathways, the T-cell is activated but the proliferation and survival of T-cells/immune response is terminated. 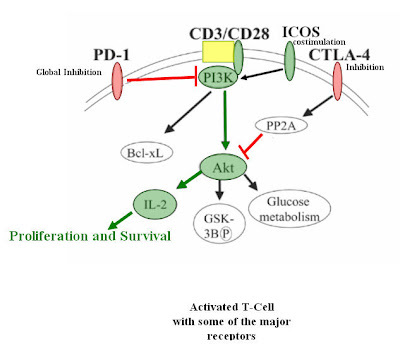 Based on the above model, Downstream of the CD3/CD28 signaling the co-inhibitors down modulate the P13/Akt signaling. Signaling via CD28 is required for optimum IL-2 production, cell cycle progression, and survival. CD28 is constitutively expressed on naive CD4+ T cells is slightly upregulated after T cell activation. 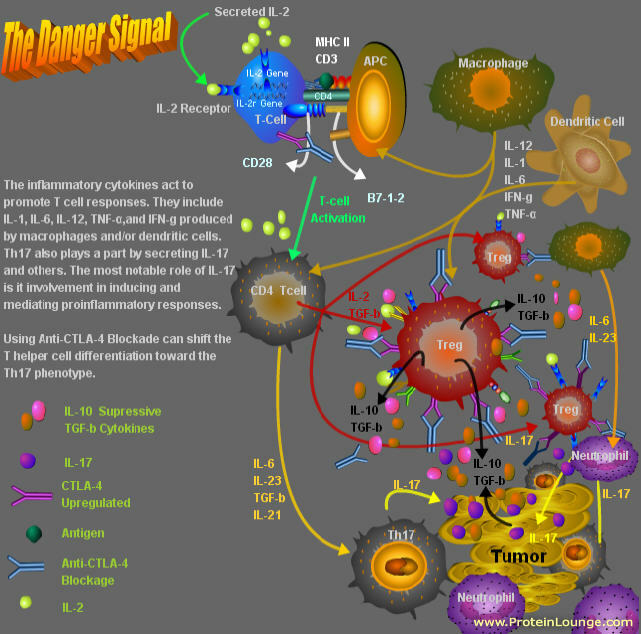 The CTLA-4 and the PD-1 expression increase over time in Melanoma patients. This is why it is so very hard to eradicate Melanoma in the late stage IV. 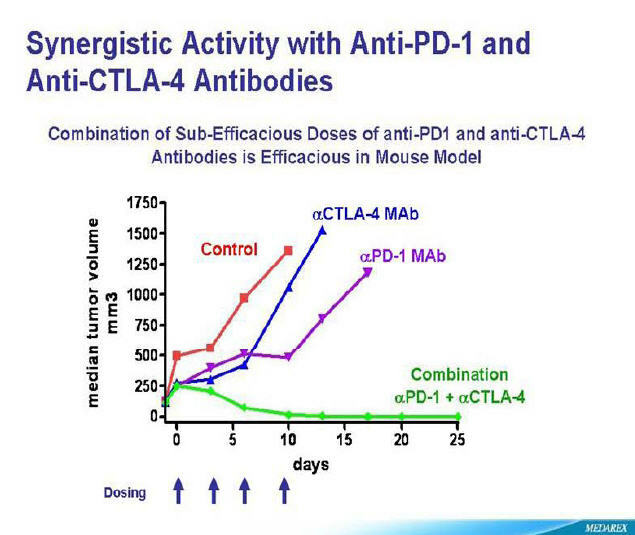 To counteract the inhibition, one can use Antibodies to block the suppressive signaling coming from the CTLA-4 and PD-1. 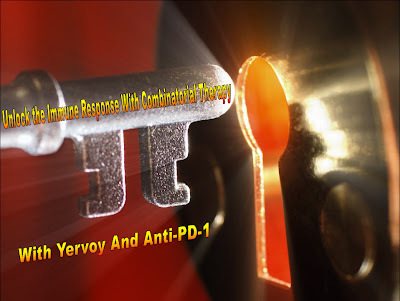 This is where Yervoy (Anti-CTLA-4) and Anti-PD-1 come into play. So if you can do a therapy with a systematic approach, you may be able to beat Melanoma. It is now known, that IL-2 can down regulate PD-1 receptor so you might not need to do Anti-PD-1 therapy. Or you might do anti-PD-1 instead of IL-2 therapy to cut down the harsh effects of the IL-2 therapy. 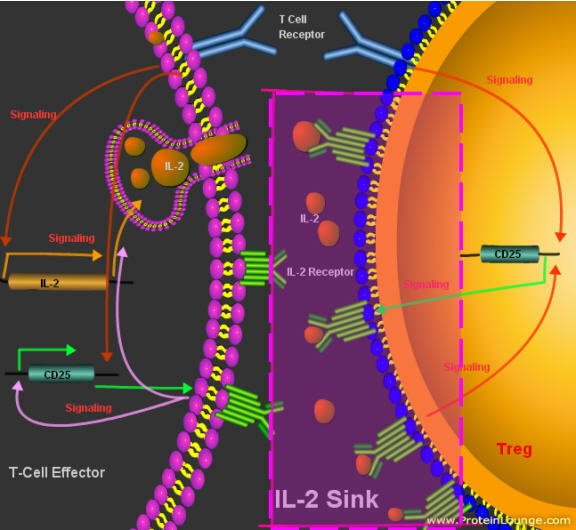 It is now known that the T-cell activation/immune response needs IL-2 to produce a robust immune response. ICOS Expression,To secrete and what to secrete is the question. 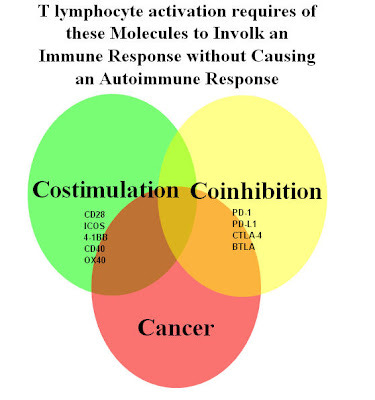 My research has taken me to the costimulators and coinhibitors of the T-cell activation. 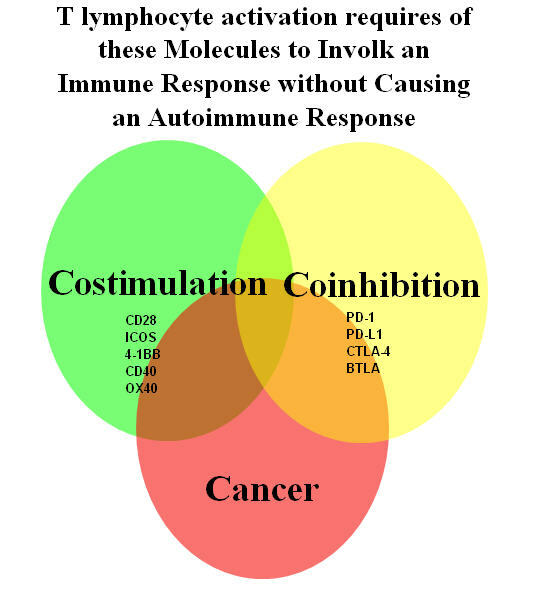 The Delicate balance between the costimulators and coinhibitors render the right immune response at the right time. One of these costimulators is the ICOS. 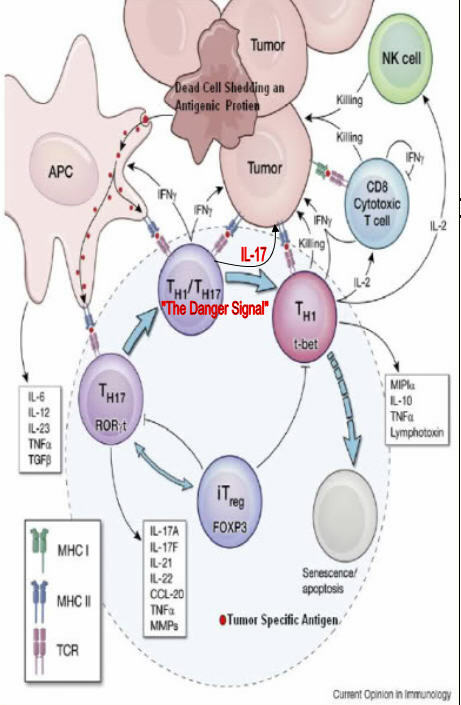 But if there is to much ICOS, then there is a down regulation of the the immune response by the secetion of IL-10 into the tumor's microenviroment. The level of ICOS surface expression regulates the magnitude of the in vivo Th1/Th2 ratio, perhaps by influencing Th2 differentiation. 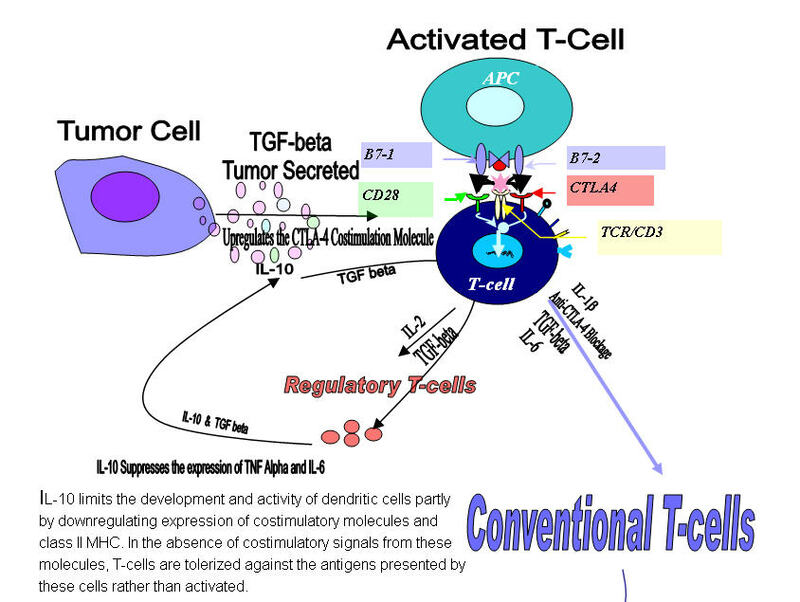 This regulation plays a major role in the differentiation of the T-cells. The linkage between low ICOS expression and “early” cytokines, and between intermediate/high ICOS expression and “late” cytokines is intriguing and could mean that ICOS is gradually up-regulated in the course of progressing T cell differentiation. ICOS-low-cells were found to be loosely associated with the early cytokines interleukin (IL)-2, IL-3, IL-6, and interferon (IFN)-gamma. 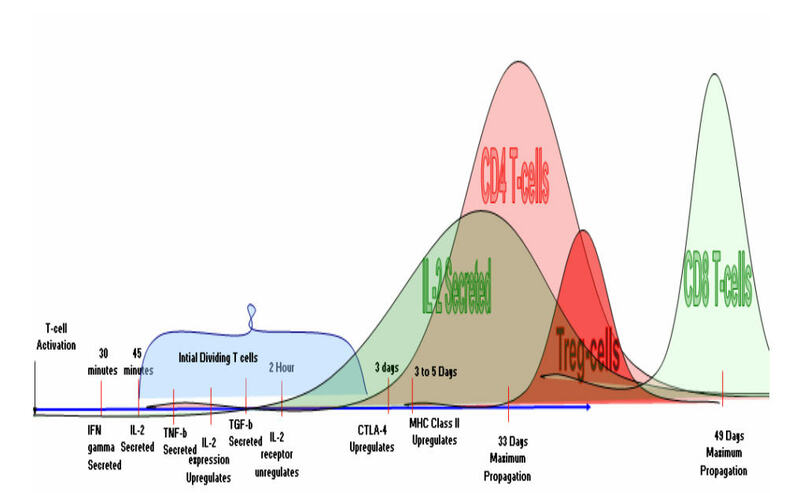 ICOS-medium cells, the large majority of ICOS_ T cells in vivo, were very tightly associated with the synthesis of the T-helper type 2 (Th2) cytokines IL-4, IL-5, and IL-13, and these cells exhibited potent inflammatoryeffects in vivo. In contrast, ICOS-highT cells were highly and selectively linked to the antiinflammatory cytokine IL-10. 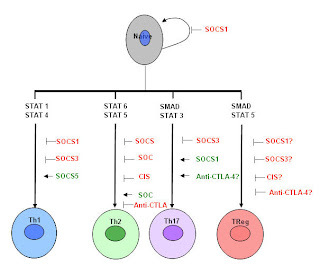 The strength of the effector response of Th cells is regulated by the control of ICOS expression. Overall, this data seem to indicate that ICOS cell surface density serves as a regulatory mechanism for the release of cytokines with different immunological properties. 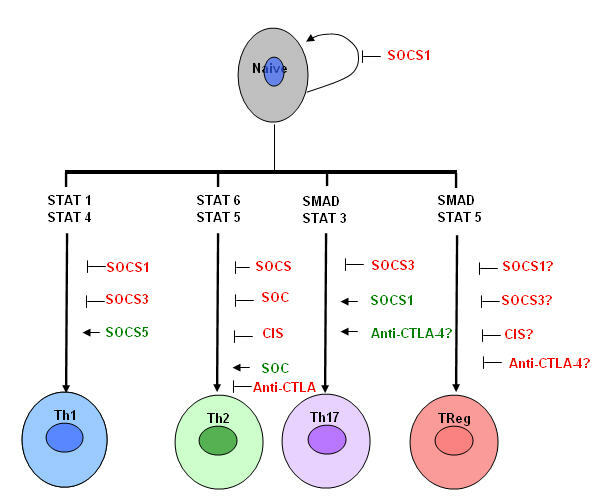 We want the low expression of ICOS which seems to differeniate the niave T-cells towards the TH1 T-cell phenotype. We can accomplish that with Yervoy (Anti-CTLA-4). 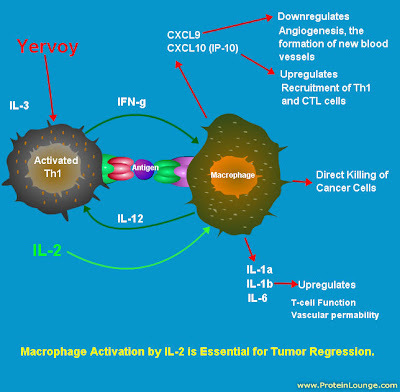 STAT5 signaling is found in both the Th2 and Treg pathway.It just so happens Yervoy causes the phosphorylation of STAT5 to decreased significantly with increasing concentrations . 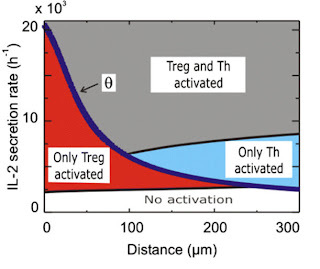 Yervoy skews the T-cell differentiation towards the Th1/Th17 phenotype which we want. 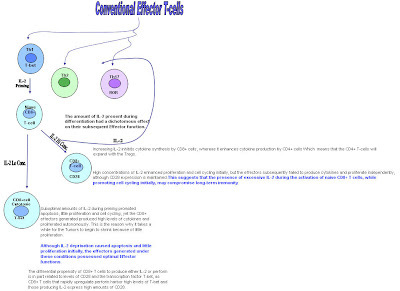 Another coinhibitor which surpresses the immune resonse is (PD-1) Program Death 1. Blockade of PD-1 by monoclonal antibodies specific to its ligands (PD-L1 and PD-L2) results in significant enhancement of proliferation and cytokine (gamma interferon [IFN-gamma] and interleukin-2 [IL-2]) secretion by tumor-specific CTLs. 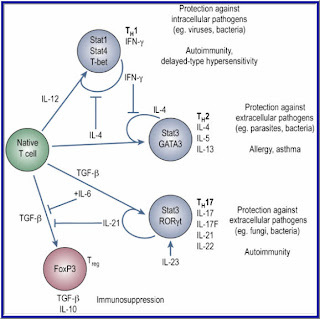 PD-1 blockade also resulted in down-regulation of intracellular FoxP3 expression by Tregs. So by do a combinatorial therapy with Yervoy and PD-1 antibodies, It would most likely have a synergistic immune response. This why on 9-20-2011, Bristol Myer Squibb expanded it's deal with Japan's Ono Pharmaceutical Co. Ltd. BMS now knows that they have an monopoly on T-cell activation and can be applied to many other cancers besides Melanoma. They are collecting the "String of Pearls". It would not surprise me they will go after the rest of the costimulators and coinhibitors on the T-cells. Only time will tell. My hope is that Bristol Meyer Squibb uses it for the cure of cancer one day and not just monetary gains. 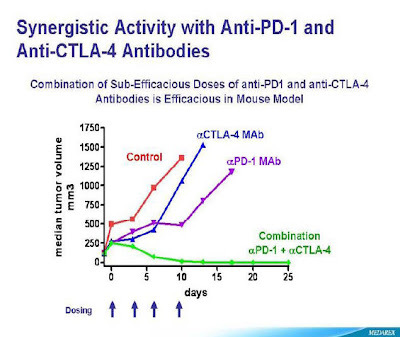 Ipilimumab is anti-CTLA-4 monoclonal antibody. 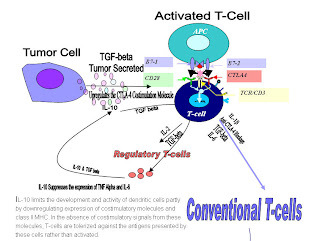 In T-cell activation, the receptor, CTLA-4 is upregulated on about day 3. The CTLA-4 complex can suppress the immune response. 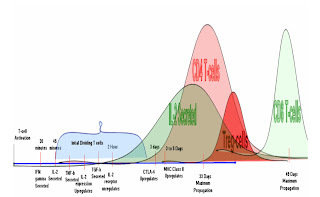 CTLA-4 that interferes with Dendritic cell (DC) costimulation via reduced CD80/CD86, (B7-1-2) expression and CD25 (IL-2 receptor) to allow for Treg survival, activation, and effective competition for limited IL-2 during infection. 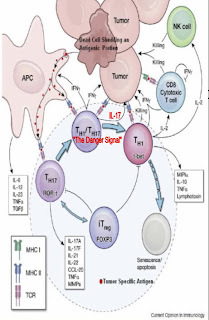 Ipilimumab (Yervoy) works by blocking the CTLA-4/ B7-1/2 complex, which allows the costimulation of the CD28// B7-1/2 complex to take place. 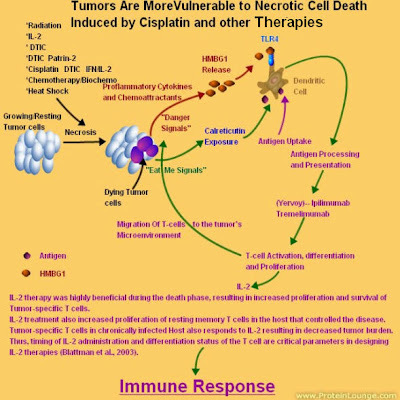 This takes the brakes off the immune response allow the response to go unchecked. Another thing Yervoy does is that it decreases the signaling of STAT5 with increasing concentrations. That is why the best overall concentration is 10mg/Kg. 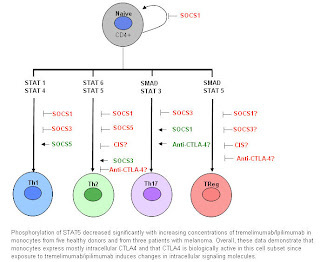 Phosphorylation of STAT5 decreased significantly with increasing concentrations of tremelimumab/Ipilimumab in monocytes from five healthy donors and from three patients with melanoma. 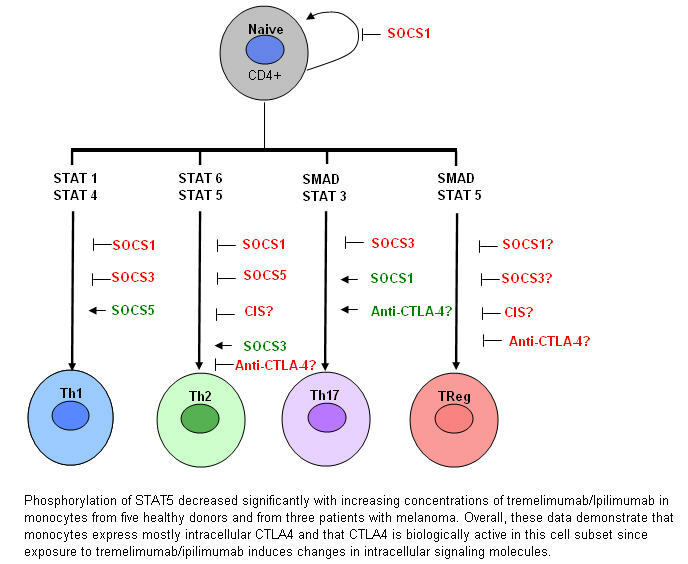 Overall, these data demonstrate that monocytes express mostly intracellular CTLA4 and that CTLA4 is biologically active in this cell subset since exposure to tremelimumab/ipilimumab induces changes in intracellular signaling molecules. 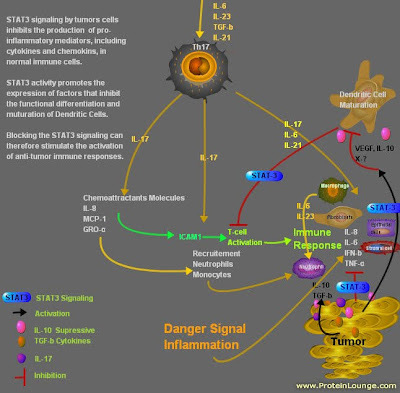 By decreasing the signaling of STAT5 during Cell differentiation, TH17 and TH1 cells are mostly produced. Reuters) - Regulators are moving quickly with Roche's application for targeted melanoma drug vemurafenib, which could receive approval as early as this week, according to a source familiar with the situation. Please if you get a chance, listen to the full interview of Dr. John Kirkwood on the lastest therapies for Melanoma. It might help save your life or loveone's life. Get a cup of coffee and a pad and pencil. I am the husband to a 39 year old woman from Denmark in Europe. In 2003 she had a mole removed from her thigh (Stage II). It contained melanoma-cells. In 2007 melanoma had spread to a lymph-node in her groin (Stage III). Surgery was needed. In 2008 melanoma relapsed in another lymph-node, surgery again. In 2009 melanoma hit us hard (Stage IV). It had spread to her lungs, one met in each lung. The size of the mets was 25 mm and 16 mm respectively. Surgery was fortunately possible. In October 2010 melanoma went back. This time there was multiples mets in each lung. About 5-6 mets in each lung. The biggest was 19 mm. It was unsurgeable, which was very hard to cope with. In November she began Interferon/Interleukin-2 treatment. It was tough beyond imagination. She had all the known sideeffects, and she was so bad during hospitalization. The midway PET/CT scans in January revealed that she was a responder! Scans showed that all the mets had become inactive or necrotic. Some mets had even shrunk a little bit. We were delighted, and she continued with the third and fourth series of Interferon/IL-2. February 15 we got the results of the next scan. We were optimistic because the midway scans was indeed promising. We were shocked when told that the melanoma had began to grow again. There was 2 active mets now. One big met, about 32 mm in diameter, in her right lung lightened up. In addiction there was a lot of fluid in the right lung membrane, and it probably contained melanoma-cells. All other mets was still inactive, except one, and our doctor feared that it would be only a matter of time, before the other mets would begin to grow again. We were devastated. She received 4 doses every third week and got a CT scan in June. Three days ago on June 21 we arrived to the hospital to talk with our doctor about the results of the CT scan. The time from the scans being done and to get the results is awful with a lot of anxiety, you guys all know… The scan showed that the 32 mm met in the right lung was completely GONE!!!!! The fluid was gone too, and the x-ray showed a nice healthy looking right lung. We were stunned. I hugged my wife with a lot of tears in my eyes. Our doctor was very delighted too. Ipilimumab had worked much better than expected. We had hoped for stabilization, maybe shrinkage, if we were lucky. But this???? Unbelievable. Some other small mets was still there but hasn´t grown in size in half a year, and our doctor said it very well could be necrotic tissue. So this story is to all you Warriors out there, keep on fighting with believe and trust in your hearts. The path is very tough but the battle can be won, sooner or later. We´ll keep fighting this Devil. 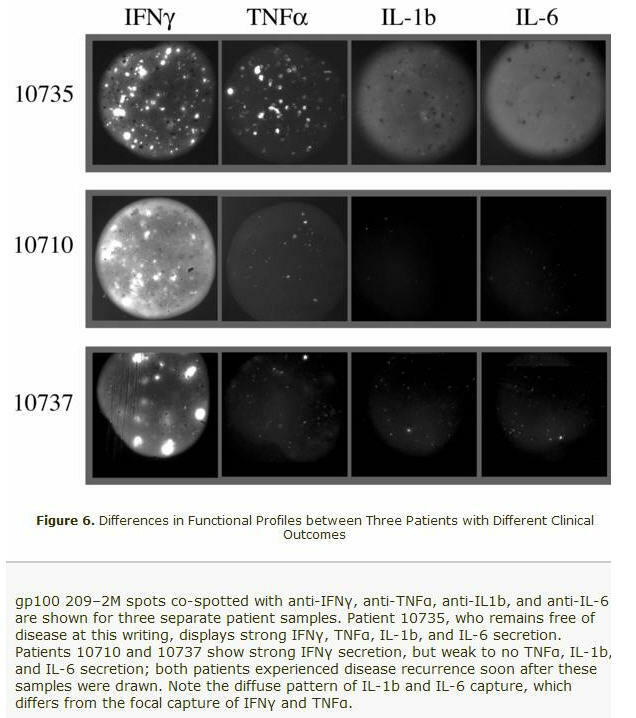 Did High Dose Interferon Alpha set the stage for the perfect Orchestration of an Immune Response? As I continue my search for the Holy Grail, I need to keep grounding myself to what really took place in the Melanoma treatment. I can not keep wondering if Interferon therapy had played a part in our successful treatment. Both Vicky and I did some IFN therapy first. NEW YORK (Reuters) - Bristol-Myers Squibb and Roche Holding AG said on Thursday they would evaluate their respective cancer drugs as a potential combination therapy for metastatic melanoma. The collaboration involves a Phase I/II study with Bristol's recently approved Yervoy and Roche's experimental drug, vemurafenib, to determine the safety and efficacy of the combination in treating the deadliest form of skin cancer. The announcement comes as the American Society of Clinical Oncology meeting begins this weekend in Chicago, where emerging treatments for melanoma will be in the spotlight. Among the most eagerly anticipated studies being presented at the ASCO meeting will be a Phase III trial intended to show that vemurafenib extended the lives of patients with advanced melanoma, and another study comparing Yervoy to chemotherapy in patients with the fatal disease. Yervoy won U.S. approval in March for patients with inoperable or metastatic melanoma, making it the first new treatment option in many years for patients for whom there was little hope and virtually no effective medicines. Roche and Japanese drugmaker Daiichi Sankyo Co recently submitted U.S. and European applications seeking approval for vemurafenib. The drug was developed by Roche's Genentech unit and Plexxikon, which was recently acquired by Daiichi. Vemurafenib, a so-called BRAF inhibitor, is designed to selectively target and inhibit a mutated form of the BRAF protein found in about half of all cases of melanoma. The combination study with Yervoy will be in patients with BRAF-mutated metastatic melanoma, Roche said. Roche is also developing a combination diagnostic to help identify those patients with the BRAF mutation who are likely to benefit from vemurafenib. "We are entering a new era for melanoma, and are committed to studying exciting combinations with investigational medicines in our own pipeline," Roche Chief Medical Officer Hal Barron said in a statement. If proven effective and approved the Yervoy-vemurafenib combination would be an extremely expensive treatment option that could meet with reimbursement resistance from government programs and health insurers. Bristol priced a four-infusion course of Yervoy at about $120,000. Vemurafenib will likely also command premium pricing if it too demonstrates an ability to help patients live longer. More than 70,000 people in the United States and 160,000 worldwide are diagnosed with melanoma each year, according to the American Cancer Society. The five-year survival rate for the aggressive cancer is just 15 percent. All I can say.... It is about Time!!!! Lets all work together for the common good.